Ewart is economical with colour in ''A Rainy Day'' but successfully describes atmosphere and texture through his treatment of light and shade and their reflections on the wet surfaces of the city pavement. Busy figures are shown walking along a city street, framed by tall buildings. 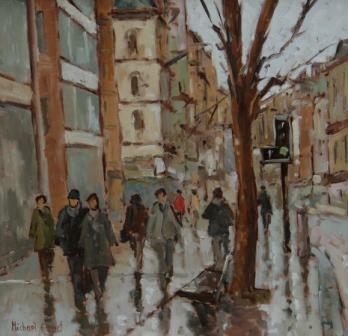 As in many of Michael Ewart''s oil paintings the viewer''s eye is drawn to one figure in the crowd wearing a red coat. In this way Ewart achieves a focus from which we can appreciate the composition he has presented to us. Michael Ewart paints exclusively in oils. Ewart feels the medium allows him to explore the feel of the subject. In addition to Red Rag British Art Gallery Michael Ewart has exhibited at other leading British Art Galleries. Each painting at Red Rag is sourced from the Michael Ewart artist studio and like all Red Rag British art and Contemporary art it can be shipped worldwide. Click here to view more contemporary paintings by Michael EWART.